In this new occasional feature, Seattle Times food writer Bethany Jean Clement and movie critic Moira Macdonald team up to rate the venues around town where you can (hopefully!) enjoy dinner, drinks and a movie — all at once. Movie theaters around the Seattle area are upping their game, trying to pry people off Netflix and back into the multiplex with menus of actual food (beyond popcorn!) and alcohol-containing beverages (hallelujah!). But are they serving more than chicken strips (and if not, are the chicken strips good?)? Are the cocktails better than the ones you make at home? How does the service work, or fail to do so? How cushy are the seats? 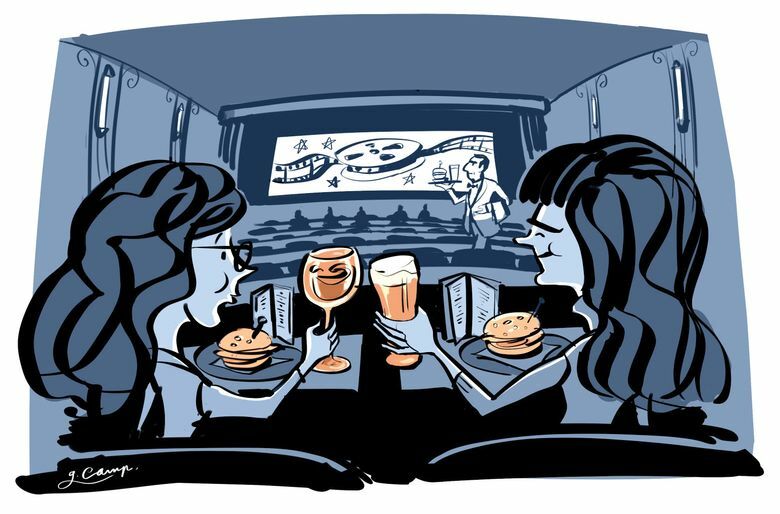 In this new occasional feature, informally subtitled “Eating in the Dark,” Seattle Times movie critic Moira Macdonald and food writer Bethany Jean Clement team up to rate the venues around town where you can (hopefully!) enjoy dinner, drinks and a movie — all at once. Moira: We chose “Murder on the Orient Express” — which seemed like a good movie to eat to, what with all the cocktails and fine dining and excellent upholstery — and the presentation was swell: big screen, decent sound. The in-theater lighting during the film isn’t quite as dark as one might wish, due to the needs of servers to scoot around without tripping on things, but visuals are fine. Bethany: I worried a little that I was missing Important Clues while attempting to see what I was eating in the dim, but Agatha Christie ain’t rocket science. The all-star cast and dumb/fun quotient felt just right for dinner at a movie. Though when the train got stuck on a cliffside trestle, I kept envying the actors their old-timey (and beautiful) outerwear; it was cold in the theater. Bethany: It was really cold! You weren’t cold? I wanted to murder Michelle Pfeiffer myself and take her fur coat. Moira: I don’t remember it being particularly cold? But you may NOT murder Michelle Pfeiffer, who is a goddess. I envied her outfits, too. And Judi Dench’s hats. But I digress. Bethany: This may seem self-evident, but a salad is a difficult thing to eat in the dark. Every bite I took seemed to consist solely of red onion, which is not an optimal salad experience. I also got some dressing — an oddly sweetish blue cheese — on my scarf. I gave up pretty quickly on the ol’ Bacon & Blues Brothers, which is just your traditional spinach-et-cetera salad ($11). All the food items here have hilarious movie-derived names! Moira found this even more hilarious than I did. Moira: The food names are the best part of the experience. I think I have spent my life waiting to order something called Apoca-Chips Now. (Though, come to think of it, I didn’t order that, and will have to go back. Also need to sample Pretzels At Tiffany’s.) I had the Chicken BLT Run ($14), partly because I love “Chicken Run,” and it was absolutely fine. As in, it was a little bland, but tasted freshly made and like chicken. Nice crispy fries. I agree with Bethany: God did not create salad in order for people to eat it in the dark. It’s hard to focus on who killed The Mysterious Edward Ratchett when you’re trying to solve the mystery in your mouth. Bethany: My Top Bun burger ($14), which I ordered with American cheese because TOP GUN, was a completely adequate rendition of the better-than-fast-food-but-not-quite-gourmet category, which, in context, was kind of great. I kept thinking, “I’m eating a hamburger AT THE MOVIES!” The nice and crunchy house-made potato chips would’ve been better without their fakey-tasting barbecue dust — they made me want to eat all of Moira’s French fries, though I valiantly refrained — but still, not too bad. Moira: Portions at Cinebarre are generous (sadly, some of those fries got left on the plate). I also ordered popcorn ($8.50) — excuse me, “Children of the Popcorn” (the people behind Cinebarre know their ’80s movies!) — midway through the movie, and it tasted freshly popped and very good, in a big silver bowl. I will not share how much of it I ate. Bethany cruelly didn’t help me very much with it. Bethany: I love movie popcorn and will usually eat it until my mouth hurts from the yellowness! This is one disadvantage of Dinner at a Movie: less stomach-space for popcorn. Upside: There are drinks. Bethany:The drinks at Cinebarre do not have hilarious movie-derived names, which is sad. Moira: Very sad! I would have enjoyed ordering a glass of F**king Merlot, inspired by “Sideways.” And I don’t even like merlot. Bethany: The drinks aren’t especially inspired in any other way, either. The wine list is of just above in-flight caliber (though with more options than on a plane — hey, what about Snakebites on a Plane!). Insult to injury: “Murder on the Orient Express” has prominent product placement for Veuve Clicquot. The cocktails, accompanied by glossy, all-too-colorful photos, run to the likes of black cherry Long Island iced tea (because regular Long Island iced tea isn’t black cherry enough?). For some reason, I took an ill-advised chance on a pineapple-jalapeño margarita ($10), which was overwhelmingly sweet and underwhelmingly spicy. I complained about it to Moira and then vacuumed it up in about four minutes. At least it went down easy! Moira: I played it safe and had prosecco ($8). Nice and light and bubbly. Sort of the popcorn of wines. It was cold and … what can I say? Absolutely fine. And the mid-movie Diet Coke ($4), an important mainstay for professional moviegoers such as myself, was stellar. Moira: You order by writing down what you want on a pad and sticking it in a rack; a server collects the order and delivers food/drink promptly. Everything came exactly as ordered, including modifications (no cheese on the Chicken BLT Run, because cheese on a BLT is just wrong). Servers were very sweet and efficient, and food was brought to us swiftly. Nobody tripped in the dark, which I had worried about. Bethany: I liked how they half-ran back and forth, crouched down, like ball boys at Wimbledon. They care about your sightlines! Moira: I found the paper-towel racks, dangling below the table, to look a bit toilet-paper-rackish? But definitely useful. Nice vintage movie posters in the lobby, which gives the place an old-timey feel. Moira: Seeing “Murder on the Orient Express” makes one hyper-aware of sconces. Bethany: In “Murder on the Orient Express,” Hercule Poirot (played by Kenneth Branagh) says that he enjoys perfect things immensely (he is seen measuring the height of his hard-boiled eggs), and that he can’t stand anything else. Cinebarre would drive him nuts, but with my expectations set low, I enjoyed it perfectly well. I would totally go back. Moira: Things I loved about Cinebarre: the ticket price (a mysterious but unbelievably cheap $7.13 for a Tuesday matinee; on other days matinees are around $11), the nice staff, the wonderfully decadent and curiously sensual experience of eating French fries in the dark. (Sorry, Netflix; that’s hard to do at home.) To quote the Terminator — who, sadly, does not have a menu item named after him at Cinebarre — I’ll be back. Updated at 9:47 a.m. Dec. 22, to clarify the price of the matinee. Bethany Jean Clement: bclement@seattletimes.com. Moira Macdonald: mmacdonald@seattletimes.com.